Here’s a fun little story for a slow holiday week here in America. The new web-based program, the Cookie Caster, won’t print out your cookies (although I’m sure someone will modify their 3D printer that will do that as well), but it will let you design and print your own cookie cutter. If you own your own 3D printer, you may have already printed a cookie cutter with your own design or by downloading one of the many found on Thingiverse. But now with Cookie Caster, custom make cookie cutters are available to anyone whether or not they own a 3D printer or a 3D modeling program. 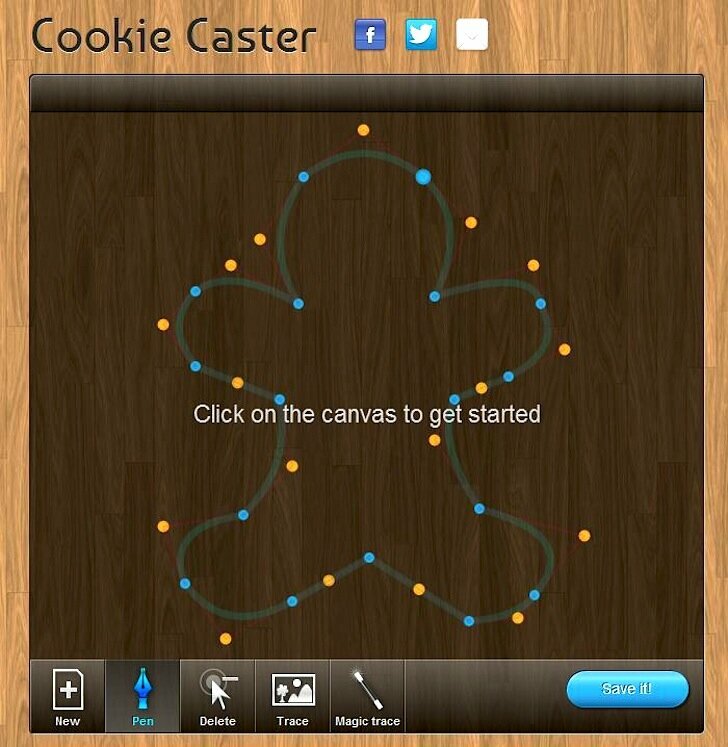 Cookie Caster’s drawing tool let’s you very easily design your cookie cutter freehand on the screen, literally in minutes. If you have an image that has a design that you’d like to model your cutter after, you can upload the image, and then trace over it on the page with the drawing tool. And, there’s a gallery of previously drawn designs that you can browse through and reuse. If there’s a design you’ve created or located in the gallery that you what to create for yourself to use in your own kitchen, you have two choices. One option is to place an place an order for Cookie Caster to 3D print and send you the item. Depending upon the size, it looks like you’ll pay from $12 and up. But you are also allowed to simply download the .STL file to print on your own 3D printer if you have one — for free. Very nice. The program was inspired by the cookie cutter work of Guru. The Makerbot blog, which reported this story and gets the hat tip from us, says that their app has just made some simple updates to Guru’s and put it on the web.